In 2005 HPAI H5N1, which had been simmering in Southeast Asia for several years, broke loose at Qinghai Lake, China and then began spreading - via migratory birds - into Europe, Africa, India and the Middle East. Within 18 months the number of countries reporting the H5N1 virus had jumped from 15 to more than 60. Two years ago we witnessed much the same with HPAI H5N8, which emerged in a big way on the Korean Peninsula in January of 2014 in wild birds and sparked major poultry outbreaks, then was carried by migratory birds to Japan, and the following fall turned up in Europe, and followed by Canada and finally the United States. The world's major migratory flyways are illustrated in the map above. While most flyways are north-south oriented, their overlapping allows for a lateral (east-west) movement of avian viruses as well (see The North Atlantic Flyway Revisited & FAO On The Potential Threat Of HPAI Spread Via Migratory Birds). Just months after the emergence of H5N8 in early 2014 (which followed H7N9, and H10N8 in 2013), we saw a new reassortant HPAI H5N6 burst onto the scene in Southern China, infecting (and killing) a 49 y.o. poultry dealer in Sichaun Province. Over the summer of 2014 we began seeing scattered reports of H5N6 in poultry outbreaks in China, Laos, and Vietnam. Human infections remained rare - with only 4 reported up until December of 2015. Since last December, however, we've seen 10 new cases reported (see map at top of blog). Last year Hong Kong reported H5N6 in migratory birds several times, and last February Hong Kong reported several H5N6 Positive Chicken Carcasses washing up on their beaches, presumably dumped somewhere up the Pearl River. Like H5N1 and H5N8 before it, H5N6 is becoming well entrenched in Asian poultry, appears to be spreading courtesy of wild and migratory birds, and presumably has similar potential for international spread. All of which brings us to a new report - published overnight in Nature - which describes the detection of HPAI H5N6 in migratory bird feces collected months before, and hundreds of miles away from, the first known outbreak in Sichuan China in April of 2014. This report goes on to trace the convoluted evolution of this reassortant virus, and warns of its potential for further spread via migratory birds. In May 2014, China formally confirmed the first human infection with the novel H5N6 avian influenza virus (AIV) in Sichuan Province. Before the first human case was reported, surveillance of AIVs in wild birds resulted in the detection of three H5N6 viruses in faecal samples from migratory waterfowl in Chenhu wetlands, Hubei Province, China. Genetic and phylogenetic analyses revealed that these three novel viruses were closely related to the H5N6 virus that has caused human infections in China since 2014. A Bayesian phylogenetic reconstruction of all eight segments suggests multiple reassortment events in the evolution of these viruses. The hemagglutinin (HA) and neuraminidase (NA) originated from the H5N2 and H6N6 AIVs, respectively, whereas all six internal genes were derived from avian H5N1 viruses. The reassortant may have occurred in eastern China during 2012–2013. A phylogeographic analysis of the HA and NA genes traced the viruses to southern China, from where they spread to other areas via eastern China. A receptor-binding test showed that H5N6 viruses from migratory waterfowl had human-type receptor-binding activity, suggesting a potential for transmission to humans. These data suggest that migratory waterfowl may play a role in the dissemination of novel H5N6 viruses. There is a danger that H5N6 may be carried by wild birds to other areas during their long-distance migrations and then transmitted to domestic poultry. A precedent was the spread of H5N1 virus to Europe and Africa since the outbreak in Qinghai Lake after 200517,40,41. 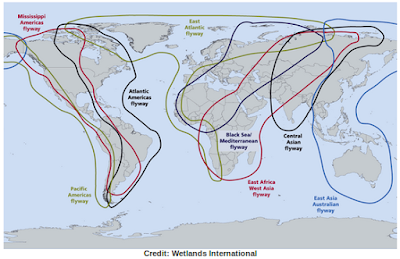 Recently, the intercontinental spread of novel reassortant H5N8 viruses, from Asia to Europe and then to North America, was attributed to the migration of wild birds42,43,44,45. It has been demonstrated that the spring migration of wild ducks in Poyang Lake follows the East Asian Flyway along the coast to breeding areas in northern China, eastern Mongolia, and eastern Russia46. 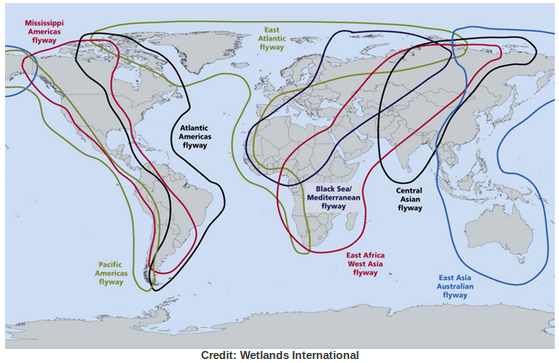 Since the Chenhu wetlands and Poyang Lake are located on the same flyway, it is possible that H5N6 may be transported to these breeding areas (Fig. 6). After H5N6 viruses were identified in migratory birds during February and March 2014, an outbreak of H5N6 in poultry was subsequently reported in north-eastern China (Heilongjiang Province) in September 2014. Although genetic information on the H5N6 strain in Heilongjiang Province is not currently available, it cannot be excluded that the H5N6 viruses may have since then disseminated to other areas along the migratory flyways. In this study, the receptor binding activity of the H5N6 viruses originating in migratory birds resembled that of H7N9 and H10N8 AIVs in a solid-phase binding assay47,48,49,50, and is consistent with a recent study showing that H5N6 is able to bind to receptors in the upper and lower human respiratory tract51. In conclusion, although H5N6 does not consistently possess the mutations necessary for human infections, sustained human-to-human transmission and antiviral resistance, constant surveillance is necessary to characterize the ongoing evolution of this virus in live poultry markets to ensure that this pathogen does not become a substantial public health threat in the future.